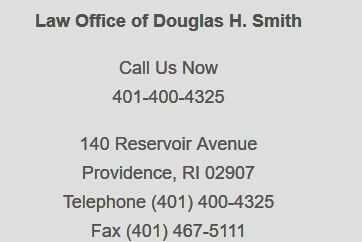 Rhode Island established professional trial lawyer Douglas H. Smith provides dedicated legal representation to businesses and individuals located throughout all areas of Rhode Island including communities such as Cranston, Warwick, East Providence, West Warwick, Johnston, North Providence, and East Greenwich. He is also licensed to practice law in Massachusetts. Specializing in all legal services for businesses and foreclosures as well as court jurisdiction disputes, the Law Office of Douglas H. Smith and well equipped to meet your legal requirements whatever they are. Check out the attorneys profile along with recent case details and make contact today to take advantage of his 25 years of law experience..